The California coast is not just for the birds. With a little exploration of the coastal rock formations and tidepools, the amount of life is quickly apparent. The beautiful colors of the starfish and crabs keep your attention until you see a group of seals or other aquatic mammals in the water or lounging on the rocks. It looks like he is smiling for the camera, doesn't it? Check out more great Watery Wednesday posts here. 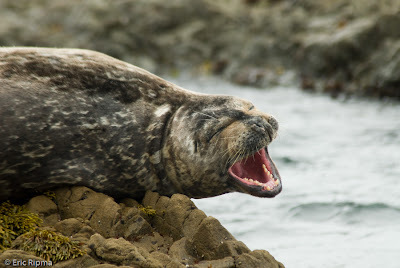 I could watch Harbor Seals and Sea Otters for hours ... seriously! 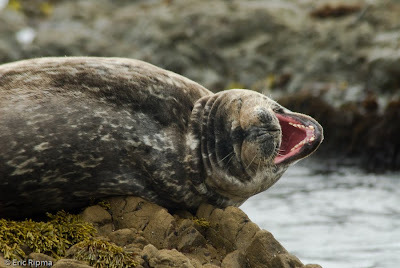 Nice yawns, now for your next assignment, a series of seals grinning....the most contented expression on any living creature I have seen was of a smiling seal in Antarctica, it was the epitome of sheer bliss. 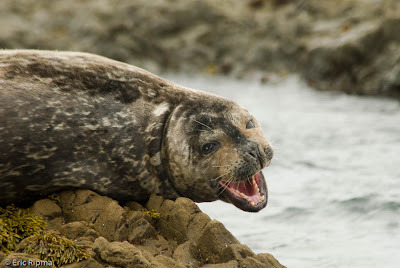 Oh, what a character your harbor seal is! Looks like he's acting for us. Great shots. I used to like to drive up the coast and see the sea lions. But they are cute! I like the plovers in the next post, too! It is amazing that you were close enough to capture the banding on the bird, so it can be identified! Cute indeed! He really does look like he's looking right at the camera in that second one. Hehehe That kinda freaked me out when the page loaded I got that 1st look at the big guy! He does look like he's smilin for the camera! Oooh, I love the yawns in different angles! I will check out your photoblog, too! You have captured some amazing expressions here! What a wonderful sight! The smiling seal looks simply gorgeous! I just love the second capture. I love shooting seals they have a great personality you got some great shots here! It does look like he is smiling for the camera. Great captures! That is so funnY! It looks like its posing and smiling for you. Great series! Wonderful details. Thanks for visiting my blog and naming those gulls. I like your other blog too. I always enjoy reading the specs of photos...yours are wonderful. I'll be back! what a fantastic shot of a seal mammal. CUTE cute CUTE....woo nice pictures..keep going..lol..